One of the toughest questions you need to answer – regardless of your income – is how much of your income you should save? 5%? 10%? 50%? What is the right answer? If your “hard” expenses are close to your net income, you won’t have much choice in the matter, but if dialing your “fun” spending up or down moves your savings rate a lot, you should take a look at the graph below. This is a simple analysis I ran to see how many years it would take assuming a fixed savings rate, inflation and investment return rate to build up a nest egg that exceeds 20 times of your annual net income adjusted for inflation. Why 20 times your net income? Well, that is a reasonable rule-of -thumb value for a retirement nest egg that has a good chance of not running out of steam before you do. 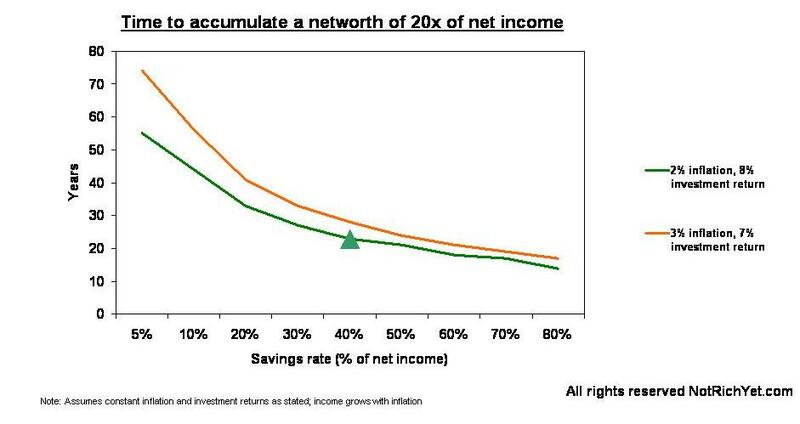 This graph shows that saving early and a lot is a good thing. So if you can only save 10% of your income, you better start at 21 so that you hit the magic number by 65. But if you have an higher income, cranking up your savings from 40% to 60% by reigning in your expenses, would allow you to retire 5 years earlier. The high-savings rate end of your graph is wrong because it’s not the income that needs to be replaced, just the expenses. See Early Retirement Extreme for why a 75% savings rate gets you financially free in 5-6 years. If you’re only saving 10-15% of income then yes, it’s nearly the same as replacing income, so it takes an extra long time. Well that depends on whether your savings rate is sustainable. If you are cutting corners everywhere and eating Alpo to make your desired savings rate, you may not be able to sustain that into retirement. Also, healthcare costs will increase with age and so will other costs, so I think that replacing income is the better approach. First, kudos to Jake for coming up with this excellent graph. I think both of you (Jake & George) have a point. Taking George’s suggestion into a account would make a pretty spectacular graph. But as Jake says, it’s good to have some margin to cover unexpected costs. I promise there will be a Part II to this post, showing different approaches. That should satisfy all.